Waddle-waddle-waddle - a waddling we go! The Penguin Parade is a MUST DO for any trip down to the Island. Each night over 500 little penguins make their way up the beach to their burrows and we are lucky enough to watch and even get a front row seat to the action. Mamma upgraded to an underground viewing ticket so Bubs had the best chance of seeing the little dudes up close - and that she did! The groups of birds walking centimetres from the windows, pausing momentarily to stare right back at you! This intimate underground viewing room is capped at 70 people and is the perfect choice in the middle of winter when the weather is unpredictable. The Penguins Plus option is another upgrade option that is well worth it as your little ones can really get a great view of the other little ones as they meander under and past the boardwalks. Regardless of your ticket option, you will get to see and hear the little penguins up close as many make their way home to bed up around the main boardwalks. You might even have to wait, like Mamma did, for a fussy little one to cross the road as we were making our way to the main centre. Unfortunately no photos can be taken of the parade itself to share - I guess you will just have to take the family and see them for yourselves. 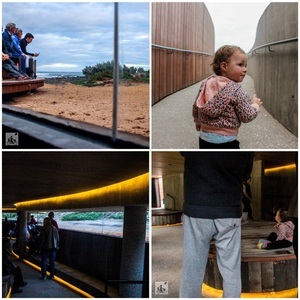 Mammas special mentions: the best way to see all the great nature parks that are on offer at Phillip Island is with a 3 Park Pass and can be purchased at the Visitor Information Centre at Newhaven, 500m as you arrive onto the Island. There are lots of options and can include the Penguin Parade, Arctic Journey at the Nobbies Centre, Koala Conservation Centre and Churchill Island.